• Bellaguarda represented his native country of Brazil when playing on the FIVB Tour from 1999 through 2003, then did not compete on the tour for five seasons. Beginning in 2009, he represented Switzerland. 2011: Bellaguarda formed a partnership with Patrick Heuscher and the duo won a bronze and a silver in their 10 events. They placed 17th in the World Championships in Rome. The duo finished fourth in the CEV European Championships. 2010: Bellaguarda and Martin Laciga had a best of fifth in their 12 FIVB events, achieving that in Marseille after losing in the second round before winning four straight elimination matches including knocking off the tournament's top-seeded team. In their only CEV event they plaved ninth in the European Championships. 2009: Bellaguarda formed a partnership with Martin Laciga in representing Switzerland. The duo played eight events, with a best of a bronze medal in a Grand Slam in Moscow. On the CEV Tour the pair had a seventh-place finish before getting a 13th in the European Championships. They also won a CEV Satellite event. 2004-08: Bellaguarda did not compete internationally. 2003: Bellaguarda and Juca Dultra lost in the country quota in four of their first five events, with the other tournament yielding a fourth-place finish. They ended the year with a 33rd in the World Championships in Rio de Janeiro. 2002: Bellaguarda partnered with Juca Dultra, and the duo lost in the country quota in their first two events. In the season-ending event in Brazil, the duo went undefeated into the semifinals before having to withdraw due to injury. The pair also won a Challenger event and placed ninth in a Satellite tournament. 2001: Bellaguarda and Paulao Moreira had a best of ninth place twice. The duo finished 33rd in the World Championships in Klagenfurt, and four times lost in the qualifier. 2000: Bellaguarda began a partnership with Paulao Moreira, competing in six FIVB events. The duo finished the year strong, with a fifth, a bronze medal and a fourth in the last half of their schedule. 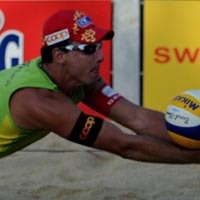 They also placed second in an FIVB Challenger event. 1999: Bellaguarda made his beach debut with Carlos Arruda in an FIVB qualifier.